What’s the one thing every kid needs for back to school? A backpack! And not just any backpack, but a Kipling backpack. I haven’t been in school for many years, but Kipling remains one of my favorite bags. Their durable material, bright colors and fun accessories make them a fan favorite (not to mention all those zippered compartments and the cute little gorillas that come with each bag!). My only problem with Kipling? They can be a bit pricey. So I was determined to find a Kipling backpack deal that was affordable for this back to school time, regardless of whether you’re buying it for your child, grandchild, or yourself. 6. After you hit “APPLY” you’ll see the screen below, taking 20% off and giving you free shipping because your order is over $49. After tax, you’ll pay just $59.78 (that includes tax and shipping). 7. From there, click “PROCEED to CHECKOUT” and enter your payment information. That’s is! 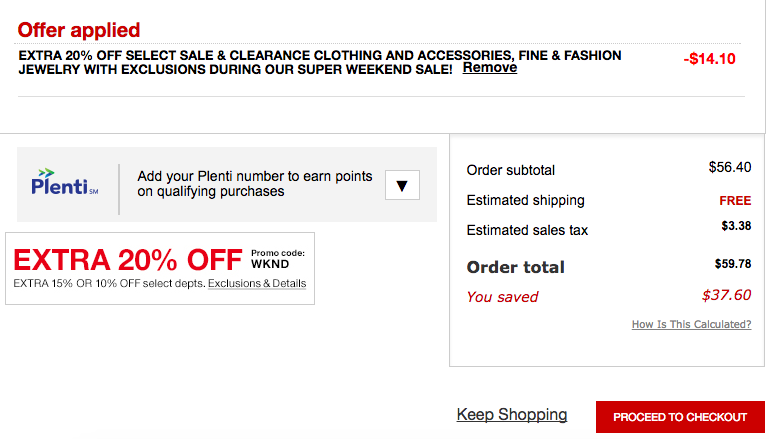 And don’t forget to add your Plenti number to earn points on all your qualifying Macy’s purchases. Just remember to enter the code WKND before checking out to score the lowest price this weekend.